Located on the road leading from Konya to the Mediterranean Sea, this han belongs to the group with a covered section composed of a single, long nef. 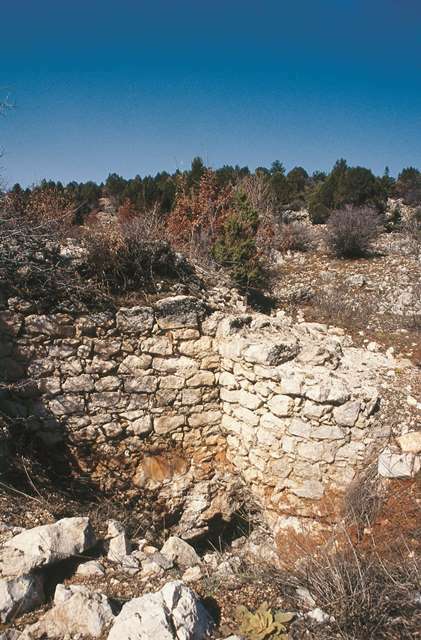 The Derebucak Han is located in the mountains south of Beyşehir. It is located on the Konya-Beyşehir-Seydişehir-Alanya road in the Derbucak region, 10 km out of the town of Derebucak, on the banks of the Karakisik River. The old caravan route in front of the han may still be seen. This road was the best option for merchants traveling from Kubadabad, the palace built by Sultan Alaeddin Keykubad, to the Mediterranean coastal cities, and the Derebucak Tol Han was the first station on this road. The next station is the Ortapayam Tol Han, which is reached after passing through the Gembos Plain. The Gembos Plain was a swampland until the beginning of the 20th century and was called in sources as the Gembos Lake. The Eynif Tol, Mutbel and Kargi Hans are located further along this road. Another caravan route, following the Alara River, exists to the east of this road and descends to the Mediterranean coast. This road still preserves paving stones dating from the Roman era. The Ebulhasan and Burma Hans are located on a third caravan route branching to the west. There are three hans which are called “Tol” (“Little Village”) which has created considerable confusion in texts. There are no references to the Derebucak Tol Han in historical sources. The building was first mentioned in a scientific article by O. Kunduraci in 2001, who also included information on the Eynif Tol and Ortapayam Tol hans in the same article. It was probably built at the beginning of the 13th century, after the conquest of Alanya by Ebülhasan. In the municipal garage inscription, there is no reference to the patron of the han in the inscription and the date indicated cannot be deciphered. It is believed that the han was built at the same time as the other hans in the region as part of a planned architectural program. Covered section only (C); the covered section comprises one long single nave (C). The existence of a courtyard has not been determined, but it may have existed. This plan is similar to the nearby Ortapayam and Sarapsa Hans. The Derebucak Tol Han, with its covered section comprised of a single nave, resembles the Kuru Han, located between Kayseri and Elbistan, and the nearby Ortapayam Tol Han, as well as the Şarapsa Han. It is not certain if there was once a courtyard, or if it had been originally planned but never built. The majority of the main walls have collapsed down to the foundation level; however, it is possible to determine the architectural features from the ruins. The han consisted of a covered section only with one nave only, and which was covered with a pointed vault in the north-south direction. According to traces on the wall surfaces, it can be determined that the roof was carried on 12 reinforcing arches. Square support towers extended to the roof level and were supported on the interior by equally-spaced rib arches on the west side. The support towers in the southwest and northwest corners are circular. Entry to the covered section was through a crown door located in the middle of the west side. The crown door projected from the main wall, but it is now completely ruined. There are two sections located to the north or the south of the entry, which most certainly were the administrative offices of the han keeper. There is an independent building south of the han, which is covered by a pointed vault in the east-west direction. The purpose of this rectangular building has not been determined. It must have been built at later date, as can be determined by the differences in the building techniques with those of the han. Some researchers believe it could have been a mosque, but there is no mihrab present to support this hypothesis. Only a few reuse spolia materials were used in the building. The exterior walls are made of pitch-faced stone, while the arches and vaults are made of smooth-faced stone. The stones used in the lower levels of the walls are larger in scale and were set more carefully than the upper level stones. Small stones and a lime mortar mix were used as infill material for the walls. No decorative elements were found among the ruins. There is a well to the northeast of the structure. This han was discovered in 1993. The caravanserai is deserted at the present time, in ruins, with its destiny left to fate. The walls were removed in the 1970s by villagers who stripped them to extract the lime plaster. Albek, Aziz. "Eynif Ovası ve Tol Han Hakkında Kısa Rapor." Anadolu Sanatı Araştırmaları, II, (1970), pp. 55-59. Bilici, Z. Sarapsa (Serapsu Han)" in Acun, Hakki ed., Anadolu Selcuklu Donemi Kervansaraylari, 2007, p. 400. Albek, Aziz. "Eynif Ovası ve Tol Han Hakkında Kısa Rapor", Anadolu Sanatı Araştırmaları, II, 1970, pp.55-59. Eravşar, Osman. Yollarin Taniklari (Witnesses of the Way), 2017, pp. 90-93. Erdmann, Kurt. Das Anatolische Karavansaray des 13. Jahrhunderts, 1961, pp. 173-75. Erten, F. Antalya Vilayeti Tahrihi, 1940. Karpuz, H. & Kuş, A. & Dıvarcı, I. & Şimşek, F. Anadolu Selçuklu Eserleri, 2008, v.2, p. 136. Kunduracı, O. "Kubadabad-Alanya Selçuklu Kervan Yolu Güzergahı Üzerine Yeni Araştırmalar-I”, I. Uluslar Arası Selçuklu Semineri Bildirileri, Konya, 2001, pp. 53-59, fig. 4. Kuş, A., Dıvarcı, I and Şimşek, F. Konya ve ilçelerindeki Selçuklu Eserleri, 2005, p. 44. Özergin, M. “Anadolu’da Selçuklu Kervansaraylari”, Tarih Dergisi, 15 (20), 148, 1965, p. 164. Redford, Scott. "The Inscription of the Kirkgöz Han and the problem of textural transmission in Seljuk Anatolia", Adalya 12 (2009), pp. 351-52. Redford, Scott. “Reading Inscriptions on Seljuk Caravanserais”. Eurasiatica 4, 2016, pp. 221-233.